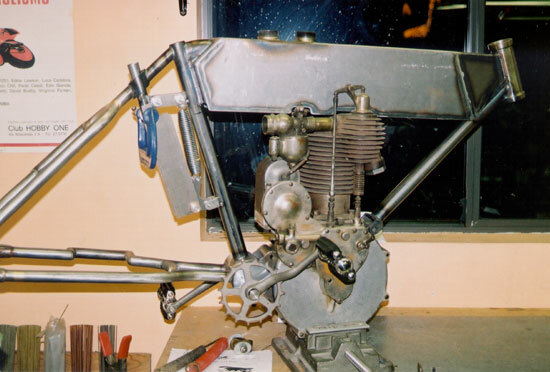 1912 Blackhawk - Paul BrodieFlashback Fabrications Ltd.
Start of the frame. Engine is lying on the bench. The dropouts (top) were salvaged from a wrecked frame from the same era. They had the correct “look” to them. The big kink in the left chainstay is to provide clearance for the belt drive pulley. This company was only in business for two years, at least that’s what the phone book records show. I had a lot of company literature to work from. They proclaimed the Blackhawk simply to be the best in engineering, power, handling, everything! 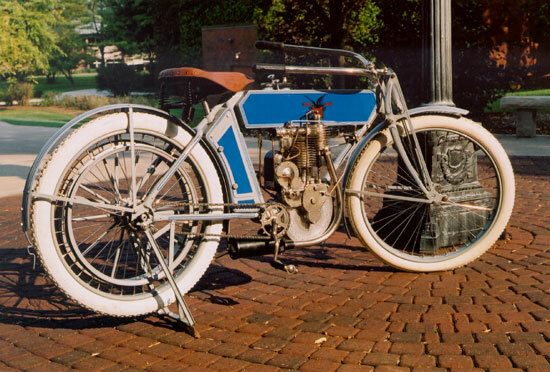 One unique feature was the gas tank which doubled as the top tube, while hiding the oil tank inside itself. Tank is 14 gauge steel. 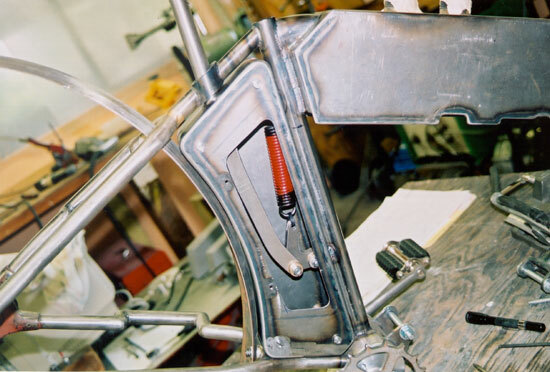 This is the workings of the “sprung” seat-post. 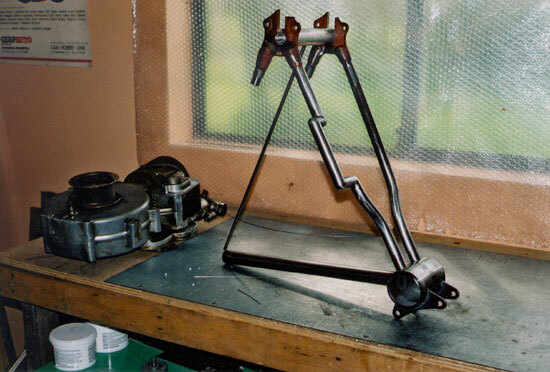 The seat-post goes straight through a tube welded into the frame. It took a little experimenting to find a suitable spring rate. 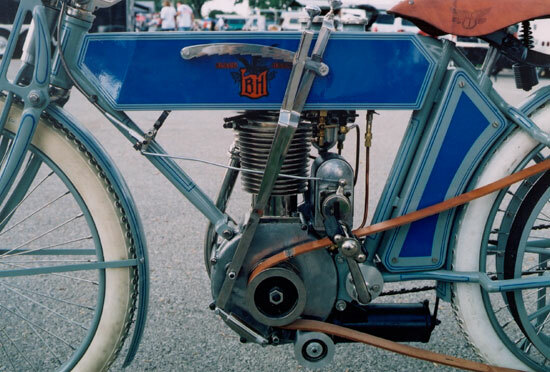 When the bike is assembled, you don’t realize the seat-post is sprung, because the whole thing is enclosed in a metal box sandwiched between the seat-tube and rear fender. Maybe that’s why it was the best bike. The front fork had very crude suspension; a bit of spring action with no dampening. 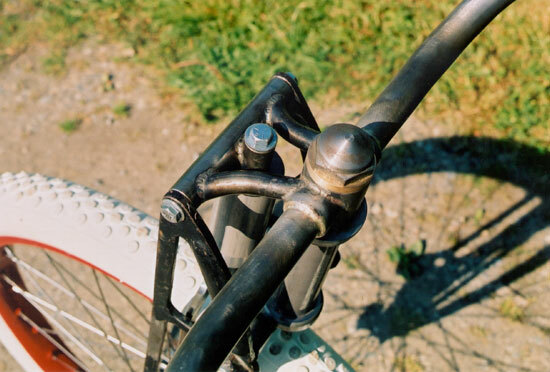 Notice how the handlebars were an integral part of the fork design. Little bit of paint, nickel plate this, and Wow! Truthfully, when Gagan showed me the picture, I didn’t even recognize it at first. It was my first antique frame project, and got me hooked. 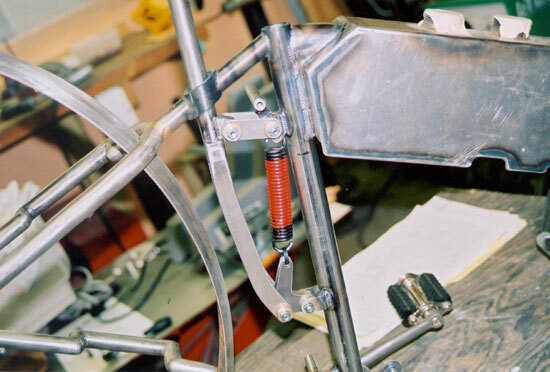 Here you can see the ratchet mechanism (on the left side of the tank) that holds the lever to control the belt tension. Blackhawk in the sunshine at Davenport, Iowa. This is a fitting spot as the factory used to be located directly across the river. Currently, this is the only model in existence, although there are four known Blackhawk motors out there looking for frames.